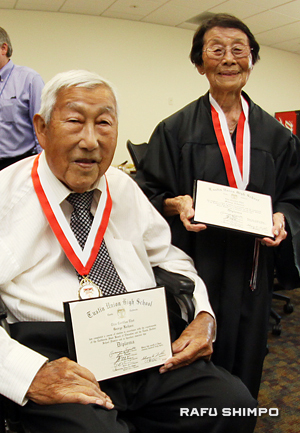 Nisei couple become members of Tustin High’s Class of ’43. 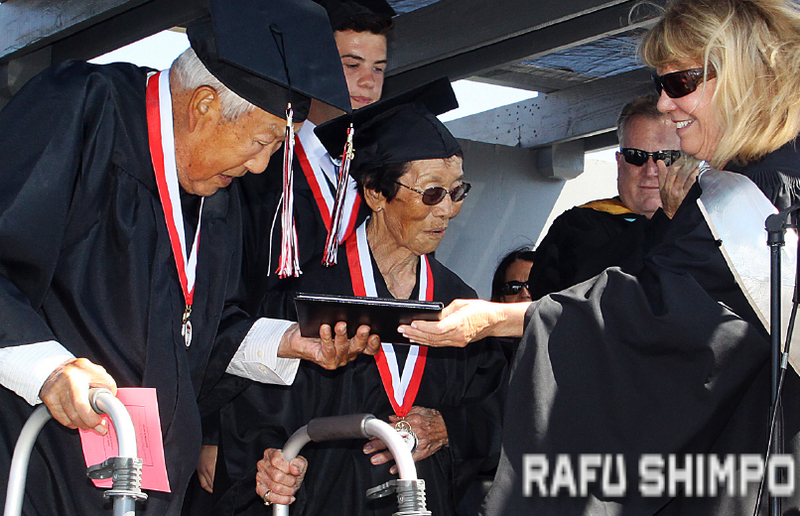 George and Mitsuye “Miko” Kaihara receive their diplomas from Tustin USD Board of Education President Francine Scinto. TUSTIN — Tustin High School’s 93rd commencement, held June 18 at Northrup Stadium on campus, featured two special guests — George Kaihara and Mitsuye “Miko” Nakamura Kaihara — who officially became members of the Class of 1943. Francine Scinto, president of the Board of Education, introduced the couple during the ceremony to cheers and applause from the assembled graduating seniors. 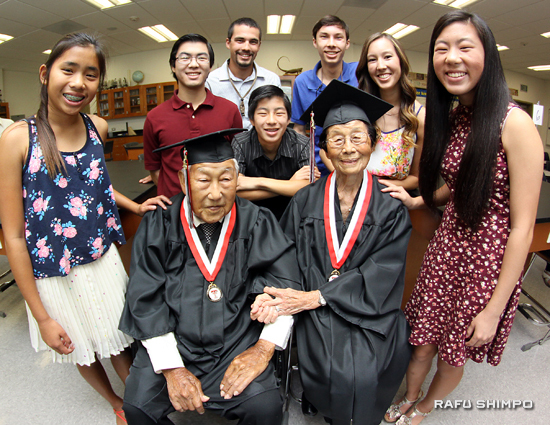 “In 1942, George and Miko were juniors at Tustin Union High School, the predecessor to Tustin High … Students from Mission Viejo, Irvine and even Laguna Beach at one point all came to Tustin Union High School,” she said. “George and Miko’s graduation was interrupted by World War II. 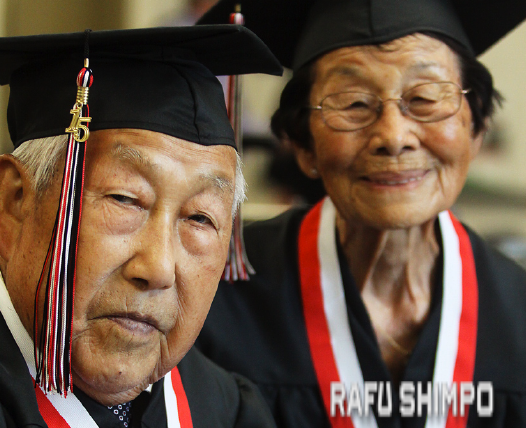 “During the war, Japanese Americans were sent to internment camps, which prevented George and Miko from graduating with their class of 1943. Although they continued their education at the camp, it has always been their wish and desire to graduate from Tustin High School. Later in the ceremony, Associated Student Body Presidents Brad Donahoo and Amanda Nguyen called on the Kaiharas, both 90, to lead the graduates in moving the tassels on their mortarboards from right to left. Donahoo and Nguyen noted that the Class of 2015 — at 550, Tustin High’s largest graduating class ever — is the first class to use the newly remodeled Northrup Stadium, won the CIF championship in their freshman and sophomore years, and had the largest prom attendance in history. The stadium is named for Orville Northrup, who was the principal in 1943. Other participants included Celeste Kelly, Tustin High School Teacher of the Year; Christine Matos, principal; graduating senior Alexis Diaz, who gave a speech entitled “Unforgotten Roots”; counselor Amy Repp, who recognized sealbearers; graduating senior Danielle Espitia, who sang “Over the Rainbow”; and the Tustin High School Band, under the direction of Michael Fisk. The Kaiharas were students together at Tustin Union High School in 1942. The Kaihara and Nakamura families farmed for Irvine Ranch before the war. George Kaihara and Miko Nakamura enrolled at Tustin High in 1939. After the attack on Pearl Harbor, the FBI raided their homes and took away their Issei fathers, who ended up in a Justice Department camp in Bismarck, N.D., unable to see their families for more than a year. George and Miko would have graduated from Tustin High on June 20, 1943. Instead, in 1942, their families were given two weeks’ notice to pack up what they could carry before being shipped off to an internment camp. Two local businesses were kind enough to store some of their belongings, but they lost their homes and their livelihoods. The couple received their diplomas in Poston, Ariz.
George was drafted into the Army, but did not see combat because of a bad knee. He served until 1946 and returned to Southern California, where he and Miko were married on June 25, 1950. They have lived in Fullerton, in the same home, since 1953. “My biggest regret was not being able to graduate with the class I went to school with,” Miko told The Orange County Register. Dennis Hayden, a former Tustin High classmate and a lawyer, heard about the Kaiharas’ story and asked the school district if they could join this year’s commencement. The couple now join the ranks of Nisei who have belatedly received diplomas and degrees from high schools and institutions of higher learning throughout the state in recent years, especially since passage in 2009 of legislation introduced by then-Assemblymember Warren Furutani directing the California Community College, California State University and University of California systems to recognize their wartime Japanese American students. Many school districts and private colleges have also held ceremonies. George and Miko Kaihara with their grandchildren. The Kaiharas with their diplomas.